Lynyrd Skynyrd Guitar Riffs "The Needle and The Spoon" - Free Lynyrd Skynyrd Guitar Riffs! This free Lynyrd Skynyrd guitar riff is "The Needle and The Spoon". This is one of my favorite Lynyrd Skynyrd guitar riffs. Practice your picking before you play this riff. It is easy to play because many of the notes are played on open strings. So if you can pick this shouldn't be that hard. Start off slow using the audio tracks below and work your way up to actual speed and learn to play "The Needle and The Spoon" by Lynyrd Skynyrd. The solo to "The Needle and The Spoon" by Lynyrd Skynyrd uses power chords and a few hammer ons toward the end. You can learn this Lynyrd Skynyrd guitar riff no matter what skill level you are at. 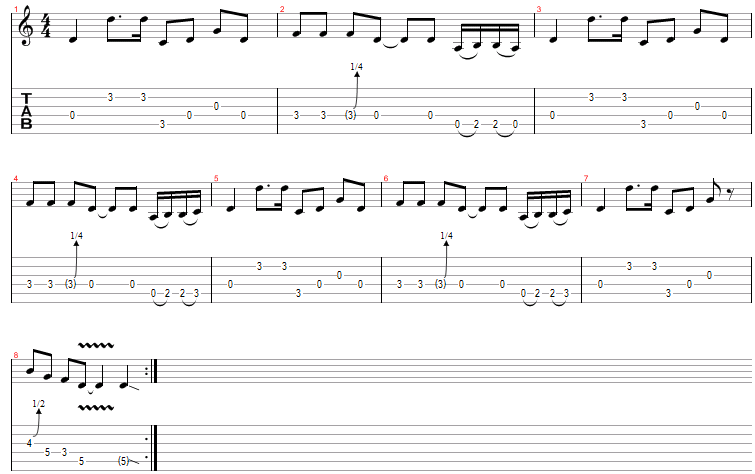 Make sure to use the audio tracks below to help you with playing this riff.